-The Syracuse-based Franklin Properties project, now called the West Court Lofts and Wellness Collective, would renovate the existing building and include 22 residential condominium units (down from 32 units in the RFEI), medical offices, a café, and community room. -The Rochester-based Cornerstone Group project, known as the Dewitt Senior Apartments, would build 63 residential units of senior housing (down from 70-80 units in the RFEI), and include community space for nutrition education by Cooperative Extension. -The Ithaca-based Travis-Hyde Properties project would build 60 residential senior-focused units (up from 48 units in the RFEI), and would include space for Lifelong, professional office, and a community room. There have been no renderings published as of yet, but there will be a stand-alone post when they show up on the county’s website. The three proposals will be judged against each other over the course of the next couple months. A quick glance at the judgement criteria can be found in the Old Library meeting notes here. The next meeting of the Old Library committee is scheduled for Thursday, April 30th at 9 AM. 5 PM Meetings will be set up during May for developer presentations to the public. Comments on the proposal can be emailed to Ed Marx, the County Planning Commissioner, at emarx@tompkins-co.org with the subject title “Old Library Property”. 2. Local credit union CFCU (Cornell-Fingerlakes Credit Union) is making some moves by buying a retail commercial strip with an eye towards redevelopment. The property, 501-507 S. Meadow Street, sold for $1,555,550 on March 30th, well above its assessed value of $950,000. According to a statement taken by the Ithaca Journal, “the current intention is to ultimately use the site for credit union-related purposes”. 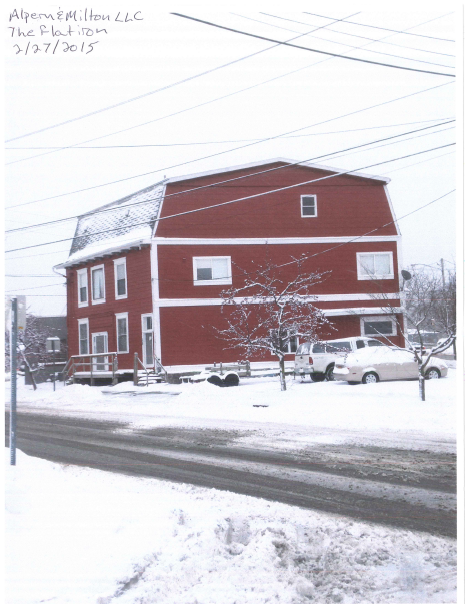 The one-story, 9,203 sq ft strip buildings date from 1980 and 1990 and previously housed a Thai restaurant and offices for Lama Real Estate, the business of previous owner Robert Lama. The site is currently zoned the suburb-friendly SW-2, but like much of big box land, it has been targeted for urban mixed-use in the city’s Comprehensive Plan. CFCU is currently headquartered in about 30,000 sq ft of office space in two 1990s office buildings at 1030 and 1050 Craft Road in Lansing. In short, nothing immediate going on here, but definitely a property worth keeping an eye on. 3. 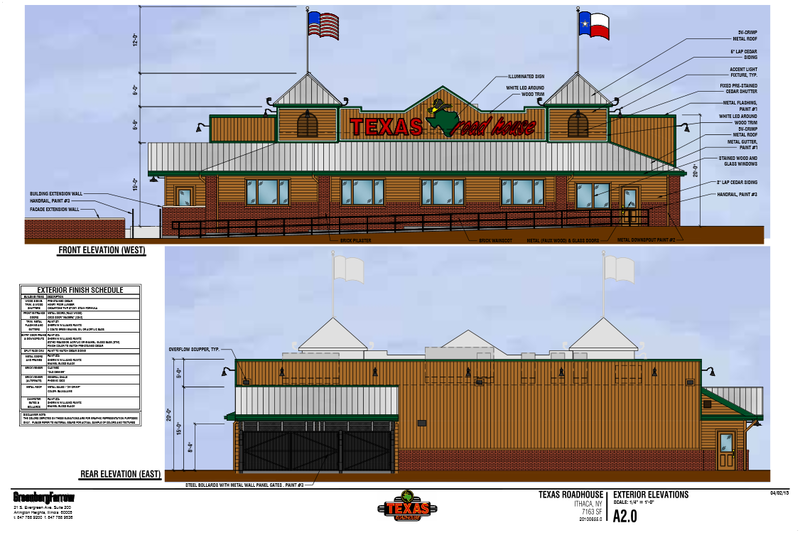 The proposal for a Texas Roadhouse on in Southwest Ithaca is getting a couple minor revisions. According to a cover letter from the restaurant chain, plantings have been revised to break up the expanse of blank walls, handicap ramps are now present in the new elevations, and signage has been tweaked. All in all, not a big change from the previously-shown drawings. It doesn’t look like this one will have too many issues moving forward. 4. 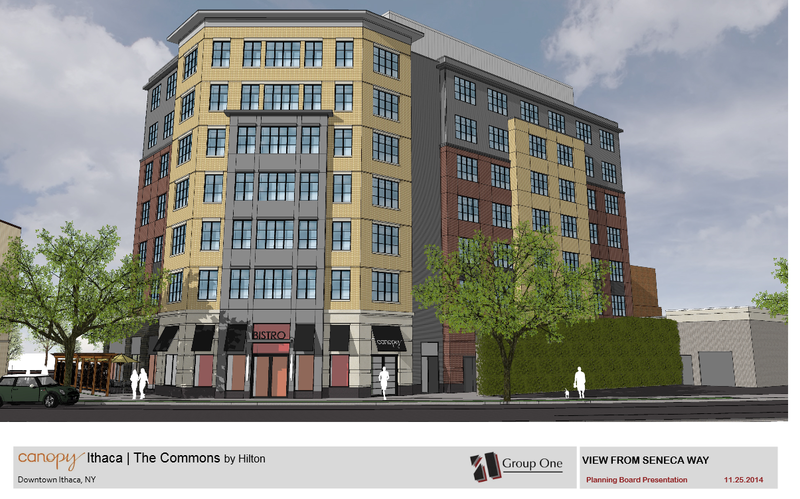 At the city’s Planning and Economic Development Committee (PEDC) meeting on the 8th, the city voted to approve the sale of land at 320-324 E. State Street to Lighthouse Hotels LLC for construction of the new Hilton Canopy Hotel. Also up for discussion was the removal of 30′ setbacks on all sides of the special MH-1 zoning at the Nate’s Floral Estates mobile home park on the west side of the city. With the 30′ rear yard setbacks already in place and vegetative buffers installed by the big boxes to the south, it was felt by the city economic developer planner that the additional setback was redundant. The removal would facilitate setbacks reduced to 10′ on one side and 5′ on the other side, if I’m reading this right. According to the notes, the mobile home park has a waiting list of tenants. The proposal looks like it will allow a few more units in the park, though it looks pretty tightly packed as-is. 5. 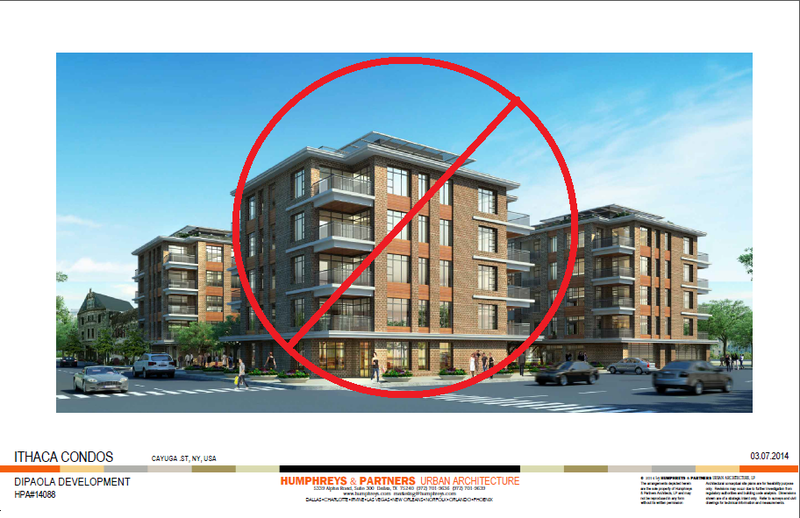 According to the Ithaca Urban Renewal Agency (IURA) notes from the April 2nd meeting agenda, the board was not impressed with the Flatiron proposal. On page 6, it gives the project low pritority, with the description “not feasible as presented“. On the other hand, the INHS Hancock Street project was well received and given high priority. 6. 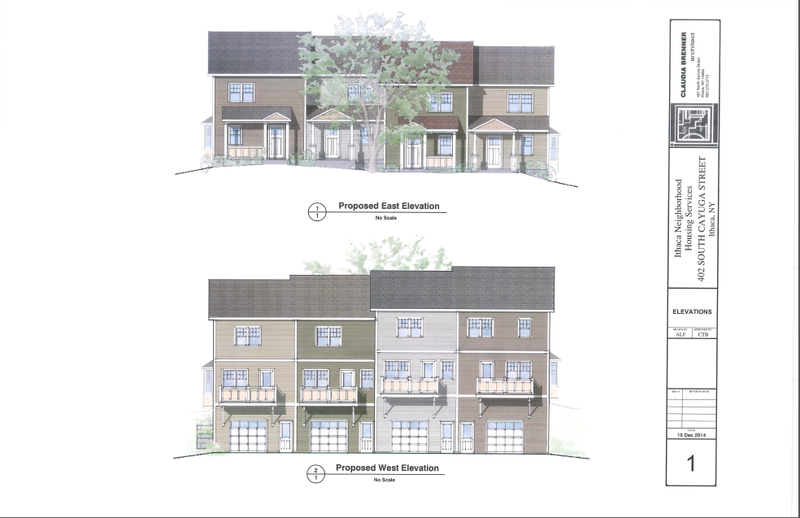 Looking at the March Planning and Development Board meeting minutes, 402 S. Cayuga Street has been approved, pending BZA approval of the variance (which was granted this week, if I have my notes right). The 4-unit, 9-bedroom project may be small, but it’s thoughtful infill and will help bring some affordable owner-occupied housing back into the city. Approvals were also granted for the city project to replace the Lake Street this summer and fall, and refurbish the pocket park to its southeast. 210 Hancock was discussed without any voting, and sketch plans were presented for the TFC HQ downtown, and the 215 West Spencer Street apartment project, which have been written about previously. The board also discussed added additional questions to the CEQR (the city’s version of the SEQR used in project impact analysis), and the revised paperwork will be reviewed at a later meeting. [Senior city planner Lisa] Nicholas briefly walked through the annual report, observing it was a very busy year with a considerable number of additional housing units built. [Board member Garrick] Blalock asked if the annual report is publicized. Nicholas replied, no. Blalock replied it should at least be sent to the “Ithacating in Cornell Heights” and “IthacaBuilds” web sites. Nicholas agreed to do so. I’ll be excited to have a copy. This would make scouting locations where construction photo updates are required a lot easier. 7. Wrapping this up with one final news piece, it looks like Dunkin’ Donuts is moving into the old Johnny O’s space at 406 College Avenue in Collegetown. So there will be one corporate coffee shop next to another corporate coffee shop and sharing a wall with a trendy fro-yo place. There’s probably a sociology thesis to be had in studying the changing retail scene of Collegetown. The County legislature has really sh!t the bed on this Old Library RFP. They fumbled this golden opportunity to influence smart growth, in every way possible one could screw this up. Disappointing. Almost as though someone is trying to fumble this (maybe they are? Kill development by incompetence). They have a real asset and had they handled this well, strong competition would have lead to an exceptional building. Where there were once 6, now there are three; How long until there will be two? Fumbled opportunity to score big. Let’s hope this is not becoming an issue around here. First the lack of interest with the Commons RFP, now this. It takes a lot of uncompensated time to prepare a proposal. If local agencies get a rep for incompetence or are too difficult to deal with (which is sometimes the case already) nobody gains. How long can it take to finalize this thing? These people are elected officials, right? Someone needs to organize an effort to hold them accountable at the polls. The way County officials have handled this property is more disappointing than when I clicked on Ithaca Builds site and saw that ISIS had hacked it. Sure. Setbacks are the distance a building is from a road, other buildings, or the edges of a piece of property. City law prohibits construction on the land within the setback. Currently, the law says that Nate’s can’t have a mobile home within 50 feet of Cecil Malone Drive, or within 30 feet of the property line on any side of the Nate’s property. The change in law proposes to remove the 30 feet rule and change the rear setback (the side that faces Lowe’s) to 10 feet. This would allow new mobile homes to be built on the southern side of the property.